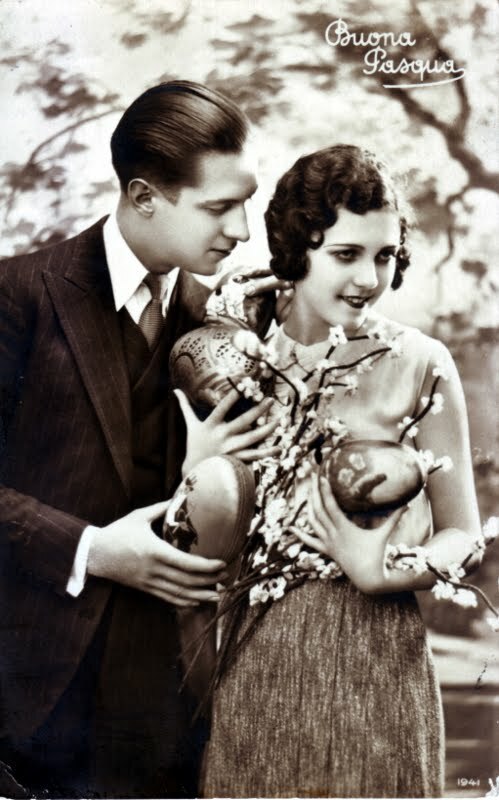 When I saw this vintage 1930s real photograph Italian postcard on a stall in Rome I was instantly attracted to the rather kitsch staged scene of a romantic couple clutching Easter eggs and cherry blossom branches – it's highly reminiscent of the poses in French postcards of the 1920s, only this later card hasn't been embellished by the hand tinted colours that were so popular in the previous decade. The models in this scene looked familiar to me – hairstyles and clothes of the day tend to blur resemblances to modern eyes, but when I got the card home and double-checked my collection I found what I'm pretty certain is the same couple posing in the snow, in a New Year's postcard from a couple of years earlier (click here to see my Christmas post). Issued by the exact same Turin-based publisher Fotocelere di A. Campassi in 1937 (although not posted until 1939), it was also dated in the same fashion as the earlier Christmas card using both the Anno Domini system as well as Roman numerals from the dark days of Italian Fascist Government with "1937 XV" printed immediately after the company address on the reverse of the card. A little metallic tarnishing in the darker areas indicates that this is probably a silver bromide print - it's a pity that those eggs didn't get the odd daub of colour too! 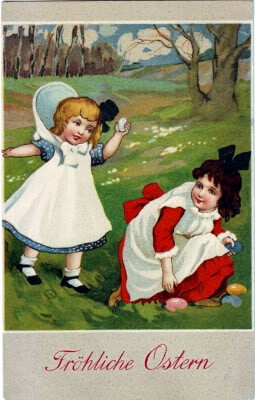 Easter falls very late this year at the end of April, although the advertising campaigns for Easter eggs have been in full tilt for a while now, reminding me of this gorgeous Easter postcard that I found on a second hand market stall some time ago and had stashed away. Posted from Löbau, a city in the east of Saxony, Germany, just over 101 years ago on 26 March, 1910, it is a very fine example of chromolithography with tight registration – there is barely a trace of the mismatched edges so common to lithographic prints using a rich palette, although the girl's hand on the left does charmingly break through the frame. The colours are still clean and bright and the postcard is also very delicately embossed with the Easter greeting in red slightly raised. 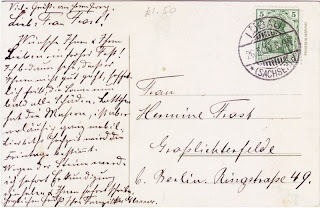 During the Golden Age of the Postcard in the early years of the last century, of course, Saxony was at the very heart of postcard production with many international firms relying on the high quality printing methods in the area, until the outbreak of the First World War stopped the industry in its tracks. 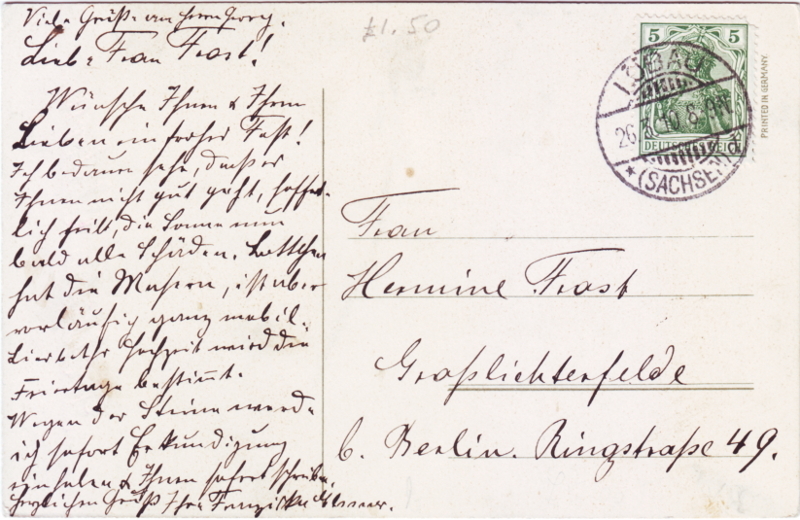 Sadly, there's no information about the publisher of this card with only “Printed in Germany” visible to the right of the 5 pfennigs Germania postage stamp of the German Empire, carrying the "Deutsches Reich" inscription. The reverse of the card is also very beautiful, albeit unintelligible...if anybody can decipher the handwriting feel free to leave a message below! I've somehow managed to skip Postcard Friendship Friday for a few weeks so this time round I'm posting early to be on the safe side!